This is an original "color beat" concept painting from the Walt Disney Studios production of The Three Musketeers (1993). 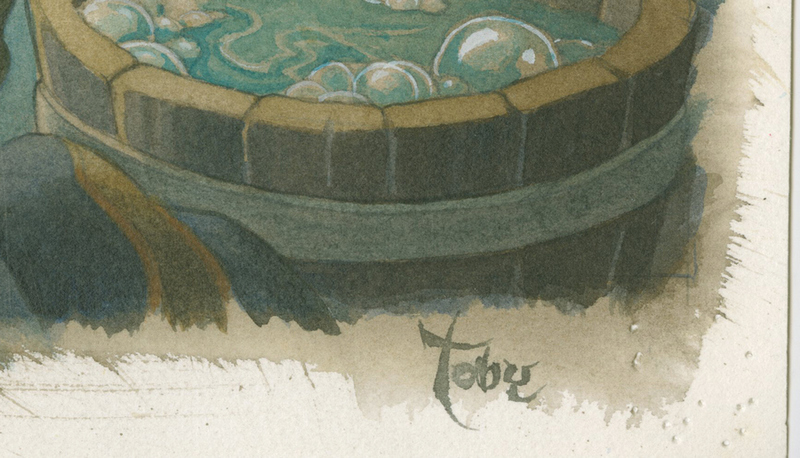 This hand-painted watercolor concept art features the laundry wash room, and was created at the studio and used during the production of the film. This painting was created by legendary animator Toby Bluth and really exemplifies his incredible talents. Toby was talented at created an image that told a full story with great character design and background layout. His talents were so well respected that he also was an artist that the Disney studio's art program would use to create fantastic imagery for its limited editions. A color beat like this would be used during production so that the director can create a standard for the color pallette used for a scene in the film. The overall measurements of the piece are 12.25" x 28.5" and the image itself measures 9.75" x 27". The piece is signed "Toby" in the lower right corner and also has a production sticker in the lower left corner designating its use in the studio.